January 4, 2015 (San Diego’s East County)-- There are so many different subjects one could mention when writing about Bill Toone, such as California condors, monarch butterflies in Mexico, mountain gorillas in Uganda, Aquaponics, Patsari and Massai stoves, holistic conservation, guided trips to Mexico and Africa, yet in the end, they all tie in together. For Toone, it is finding a holistic approach of service and conservation, and as the executive director of Ecolife, located in the Deer Park area, he has this non-profit foundation behind him. Toone has led an unusual life starting from the time he was a little boy. On a trip to the San Diego Zoo, he was so captivated by the aviary and all the birds that he decided to go back one day and work there. After receiving a master’s degree in avian science from UC Davis, he returned to work at the zoo, where he was also one of the leaders in the successful California condor conservation program which helped the birds’ population increase from just 22 to over 400. He worked at the zoo for over 35 years. He continued this conservation work and began travelling to remote regions of the world, but for him a turning point came after a tragedy in Madagascar. Many of the conservation agencies focused on one thing only: helping the people, or the animals and environment. Toone wanted to find a way to close the gap, so the Ecolife conservation was founded in 2003 as a community based organization to serve both humans and nature in a holistic and beneficial way. Its mission is the conservation of land, animals, and people. All over the world, there is a loss of habitat and species extinction. Slowly, Ecolife wants to make inroads to begin to combat that by working with local populations. In Michoacán, Mexico, Toone is working with the Mazahua and Purechepan Indians. The Mazahua were cutting down forest trees for wood, the same trees where the monarch butterflies lived in their yearly migration to Mexico. 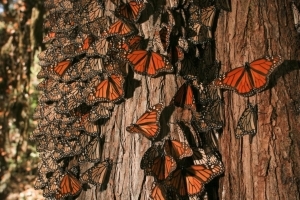 As the trees decreased, so did the population of the butterflies. In addition, smoke related illnesses were increasing. Ecolife found a solution and has introduced a special kind of Patsari stove that uses less wood, so fewer trees are cut down. In addition, the stove also produces less smoke which is better for the local people. This is a holistic approach that benefits the local population and helps to maintain the butterfly population, which in turn, helps tourism in the area. As in Mexico, Ecolife has been working with the Batwa pygmies in Uganda who were evicted from the Bwindi Impenetrable Forest, where they had lived for thousands of years. 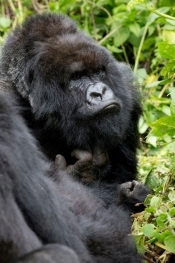 The forest is also home to the famous Bwindi mountain gorillas and other precious wildlife. The Batwa became landless peasants and “conservation refugees”. However, they still relied on the wood of the forest for their cooking. This depletion of the trees not only affected the mountain gorillas and other wildlife, but the exposure to smoke caused serious health issues for the people. To remedy this problem, Ecolife has introduced the Massai stove, which like the Patsari stove uses less wood and produces less smoke. The installation of the stoves will not only improve the quality of life for both the Batwa and Baskiga populations, but also help protect the Bwindi mountain gorillas which are a huge draw for Uganda’s ecotourism industry. Twice a year, Ecolife offers guided tours to México in the spring and Uganda in the fall. Toone leads these expeditions which are both recreational and educational. These tours also help to make people more conscious of the work Ecolife is doing. The next expedition to Mexico will be from February 15th to February 22nd. It uses 10% of the land and water required for traditional agriculture. 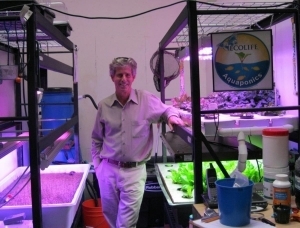 For Ecolife, it is the way of the future to conserve land and water resources. To this end, Ecolife has developed a desktop system for various K-12 schools to reach the” future farmers”. Ecolife has also developed curriculum which has been implemented in 320 classrooms, including many in the east county. They offer package deals to the schools. 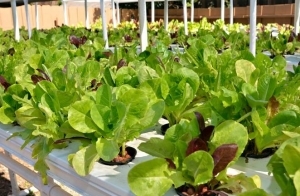 There is also a “do it yourself” Aquaponics kit that can be purchased for $250 through Amazon, but the best bet is to take one of the classes they offer. There are upcoming “Intro to Aquaponics” workshops on January 17th, February 28th, and March 28th. The workshops cost $40 per person and $30 for students and teachers. Call 760-740-1346 to register or go to their website. 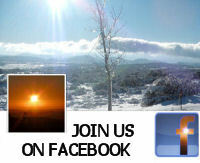 www.ecolifeconservation.org. Finally, the charismatic Toone has not only dedicated his life to various forms of conservation, his future vision is to share his holistic approach for many others to follow. 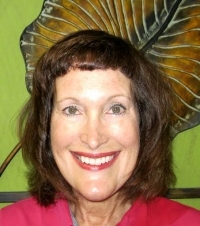 Mimi Pollack is an ESL teacher at Grossmont College and a freelance writer.